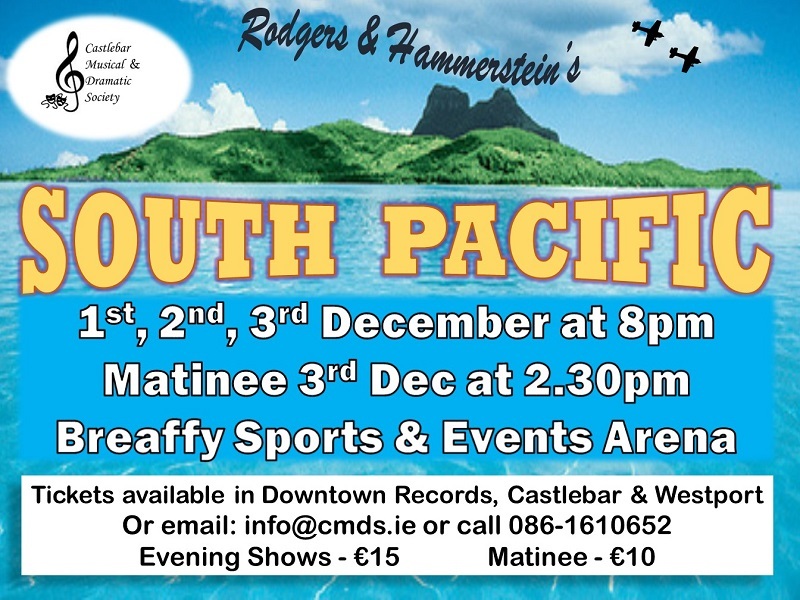 Castlebar Musical & Dramatic Society are putting the final touches to their 2016 production ‘South Pacific' which will be performed on the 1st, 2nd and 3rd of December in the Breaffy Sports Arena & Event Centre. Performances will be held nightly at 8pm with an additional matinee performance on the 3rd of December at 2.30pm. This is the third production for the society and will bring over 50 local people to the stage to perform this classic Broadway musical. ‘South Pacific' is set on a US Navy base on a small island during World War 2 and tells two love stories. One of a French planter who has settled on the island and falls in love with a naïve, bubbly nurse from the USA. The other is the story of a young ambitious Lieutenant falling for a beautiful girl native to the island. These stories are told against the backdrop of the battles of WWII and military life in the Pacific. The show, first produced on Broadway in 1949, was ahead of its time in how it deals with the themes of racism and war. Castlebar Musical and Dramatic Society are happy to welcome some familiar faces to the stage. Following his superb performance in the lead role of last year's production, Ronan Egan returns to a principal role again this year playing ‘Emile de Becque' opposite the supremely talented Vivienne Lee who will play ‘Nellie Forbush': her third production with the society. There are also some new faces to be seen in this show. Deborah Kenny, who joined the society last year, steps up to play the challenging role of ‘Bloody Mary'. While newcomers to the society, but no strangers to the stage, Seamas Cafferky and John Byrne will play ‘Luther Billis' and ‘Lt. Joe Cable' respectively. ‘South Pacific' features some of the most well-loved songs from Broadway including ‘Some Enchanted Evening', ‘I'm Gonna Wash That Man Right Outta My Hair' and ‘Younger Than Springtime'. Following their award-winning production of ‘Oklahoma!' in 2014 and the hugely enjoyable ‘Fiddler on the Roof' last year, the society continued to focus on large Broadway-style musicals for the third year as explained by director, Alanna Ní Mhíocháin: "We founded this society suspecting that there was a lot of top-class singing, dancing and acting talent in Castlebar and the surrounding area. We wanted to provide an outlet for that talent. For the last three years, we have chosen classic musicals that allow for a big cast so that we can get as many of those talented individuals as possible on stage for the show. We have been completely overwhelmed with the level of musical ability that exists in the area. We have over 50 exceptionally talented people on stage this year and we are set to put on another excellent show." "Totally 80's" Hits Balla Secondary School.